Forged wrought and steel forge welded. These two T-stakes Are similar with a minor difference, the beakhorn stake has a flat or nearly flat narrower horn, the blowhorn stake has two sizes of round horn. Beakhorn stakes vary in proportions such as the No. 901 Pexto below but blowhorn stakes are very standardized. "Blowhorn" means "horn that is blown" such as a bugle or any other musical horn. While they have many other uses the name gives away their original design purpose. Forged wrought and steel work surfaces. The two T-stakes above both have cylindrical arms of different sizes. Depending on the need this type of stake is made in various sizes and with different proportions. A Brazier is a brass worker and the name of something that holds a small fire. A Conductor is the large part at the top of a down spout. Pexto is an anagram from Peck, Stow & Wilcox Co. Originally there was Peck, then Peck and Stow, then P.S.&W Co. Roper Whitney (Formerly Whitney Punch) now owns the Pexto trade name and sells a reduced line of their tools including stakes. The 900 series tools above as well as other standard stakes are still available as there is still a lot of industrial sheet metal work being done. These stakes are used primarily for shaping and making seams in flat and rolled sheet metal for ventilation ducting, containers, and other tinsmith work. Due to the quantity in use over the years these are often found used. The Pexto stakes above are no longer available in these exact patterns. Those from the Lynch Collection are rare unusual stakes that are only found as hand or special made. Stake a called a "Marley Stake" is of unknown purpose, perhaps texturing repousse'. Stake Tapers vary, there is no standard. However, the three stakes above show a typical taper of 10 to 14 degrees found on many old stakes. Some modern makers such as Peddinghaus use much lower tapers and those machining them prefer low angles to reduce the work load. 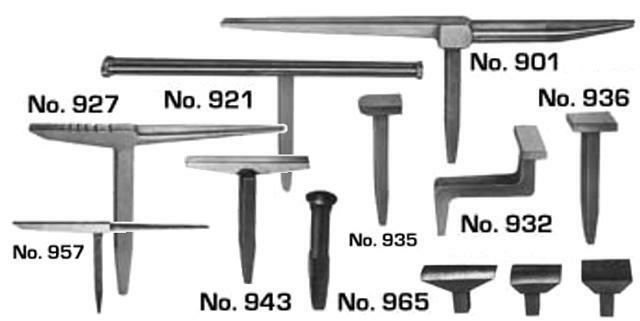 There is little difference between Stake Anvils, Stakes, T-Stakes and Bickerns. Their tapered shanks serve the same purpose, to mount the tool in a stump or tool holder. They are all primarily for cold working thin plate of sheet metal. Some are for industrial fitting of joints and others for artistic forming of the metal. 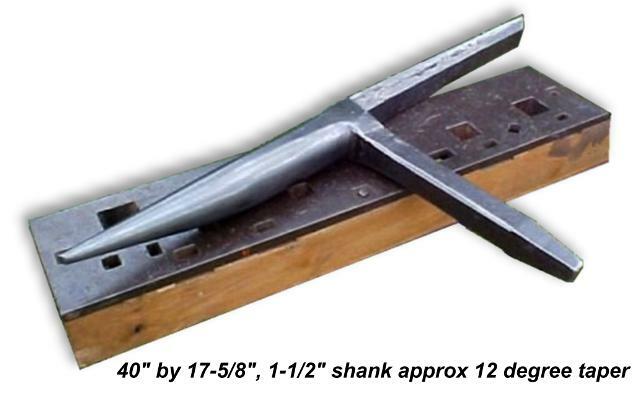 Stakes should not be confused with anvil tools which are often similar in shape and variety. Anvil tools have strait shanks to fit the hardy hole. Wedging tapered shanks into the hardy hole can result in stuck or broken tools or worse, a broken anvil. Stake anvils were some of the earliest tools dating from the Bronze Age. 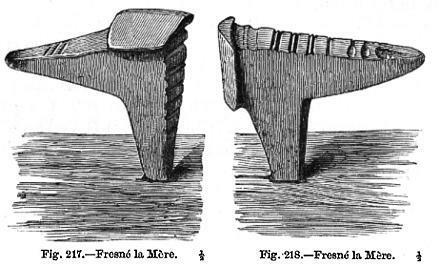 Above, an engraving of a Bronze Age anvil found in France at Fresné la Mère from, John Evans in Ancient Bronze Implements of Great Britain 2. It is a typical multipurpose Bronze Age anvil. It can be used in two positions the metal in the stake not wasted as it is also one of the work surfaces. 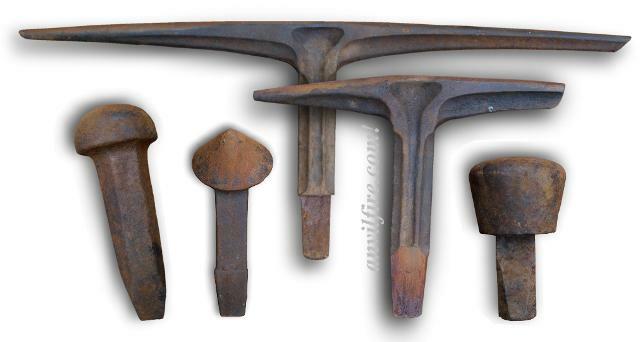 Originally used for soft metal work, stakes evolved into tools with hard steel faces for working iron. Simple stakes for raising can be just a straight or bent steel bar set into a wood block (stump). More sophisticated tools are made for special purpose. Stake names are either descriptive of their shape, what they were designed to make or the type of worker that used them. North American names may not be the same as European names. A list of stake names. . .
An interesting tool from the Frank Turley Collection. 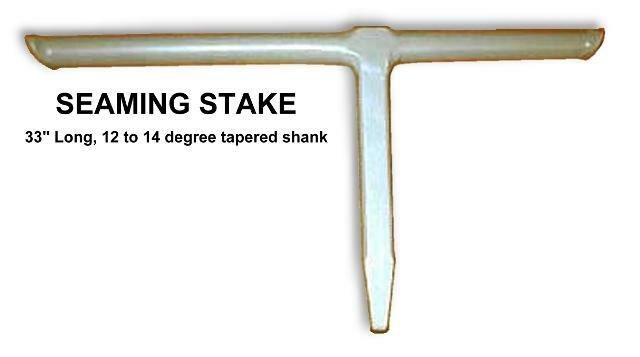 Help us collect data on stake shank tapers. From the guru's sketch book. From the anvilfire comic page featuring Frank Tabor, The Great Nippulini and others. Stake anvil made by Stefaan Meeus of Belgium in 2009. A beautiful tool of many unknowns. 16th Century stake from the Lyda-Ferdinand Collection. From the Old Millstone Forge Museum Collection. From the collection of Burnt Forge.